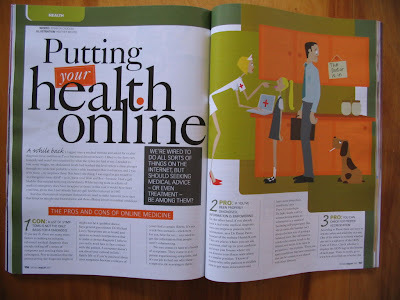 Another magazine illustration, this time for an article in the August FairLady magazine about making medical diagnoses online. It’s odd, but these illustrations I make using Illustrator don’t really feel like things I’ve done myself. It looks great in the magazine, but there’s something about the super-smooth line quality that I don’t quite like. So for this next bunch of work for FairLady, I’ve resolved to get out my knife and return to my cutting again, for a more honest and variable line. I’ve had enough of expedience-driven illustration. Time for some hard work with room for error. Anyway, I’m not sure of the name of the aunt with the rose farm but I’ll find out – wouldn’t that be cool if it were the same person! As for growing your business, I reckon we’re in a similar boat… but I think they key is to take things as they come, let it happen naturally, rather that feeling like you have to rush it in any particular direction. Are you turning your designs into cushions and teatowels yourself, or already getting someone else to make them? My hurdle is finding someone else to make things for me so I don’t have to do the actual sewing! Nice Work – and you can get it! After I posted about minä perhonen earlier in the week, Japanese blogger, Miho Sakato let me know that Akira Minagawa is holding a masterclass at the Nederlands Textielmuseum at the end of November. Read more details here. If I lived nearby, I’d definitely apply! Thanks, Miho! Check out Miho’s blog and sakatodesign website now. Cast iron gifts were the order of the day for Paul’s birthday, it seems. I gave him the japanese bird bottle opener, bought online at Canoe, and our blacksmith friend, Conrad Hicks, made him the amazing little knife. Visit Conrad’s website to see more of his beautiful blacksmithery.